That's not really what I'd class as legs though, since they're not really increasing WoW but rather just slowly decreasing and due to the dead charts, they're hanging on in the top 30. And I mean, it's still a good result for Pro Baseball Spirits, but I'd imagine that's more to do with the lack of a PSP version this year. Nah, that was already the norm. if they keep selling doesn't mean they have legs or they must enter top30 to get the "having legs" status ? Minecraft the new Monster Hunter phenomenal in Japan? Actual legs are when we see a positive WOW percentage. Steadily declining and sticking to the charts because of how pitiful everything else sells are "legs". I think we need a new term. Like feet or something. Depressing numbers.Germany and France will probably pass Japan this year in deticated gaming market (UK already has). Not a surprise sales are poor when nothing is coming out. OK sales for the Witcher though. at least one title sold over 50K... a better week comparing to last week and it will only get better next week with Splatoon! Good Witcher numbers, I had a feeling it would do well. Minecraft keeps on truckin. So according to Media Create we have only a 18.201 difference between the launch of XenobladeX, a heavily marketed and bundled Nintendo game, and The Witcher 3, an open world western RPG that no japanese must have heard of before. Let's see if Geralt can reach the 100K mark before getting out of the charts. The real breath of fresh air for May is going to be for Splatoon in next week charts, though. Constant #1 on Amazon.jp and huge preorders since two weeks on Comgnet. wow CDPR must be happy. thats a lot for a western game in japan, and thats what you get for release your game on ps platform. You exist in some alternate reality it seems. I think you know what I mean. I'm not talking about TV spots or subway ads (there was some of them, though). XenobladeX was illustrated in Famitsu on a regular basis like any big games, and got hours and hours of Xenodirect hype on the internet. Compared to whatever Spike Chunsoft could have done to market The Witcher 3 (I saw some basic trailers on their YouTube channel), I don't think I'm exaggerating when I say "heavily marketed". Last week was the worst in Japan since 2001, only 235,000 video games were sold in Japan at retail. However, in the UK even fewer games were sold. I guess Minecraft will become the Vita's highest-selling game in Japan after all. Holiday season has far bigger share of the yearly sales in west though. Digital market also has far bigger share of the total gaming market in west (In UK digital market for consoles/PC overtook retail last year). Someone elsewhere translated some Japanese comments regarding Minecraft's legs. -"That's pretty amazing considering how little it's advertised"
-"This is literally the reason why vita console sales are staying above 10k." -"I guess this means vita is the new kid's toy"
-"At this point, it's not an exaggeration to say Minecraft is a pillar supporting the vita..."
-"wouldn't it be embarrassing if the kids moved to the vita while the creepy old men stayed on 3DS?" Would you elaborate ? All the Xenodirect, the weekly updates on the website, the official twitter and the trailers on YouTube weren't enough to get attention from the Wii U gamers ? What did Nintendo marketing missed on the XenobladeX case exactly ? Watch out Minecraft, KanColle Kai is coming to get you. In units the Japanese dedicated market is still bigger but revenue wise I believe UK dedicated market is now bigger. The Xenodirect is aimed at a core demographic that was already aware of the game, its just neat "here is the game" marketing rather than random bullsho(i)t commercials, and a direct has less mass 'appeal' so to speak. The official twitter and trailers are much the same, they aren't things that your non-follower is going to really stumble across on a day to day basis. Nintendo marketed the game to the core gamer, and barely gave it much else in the way of public attention. The same sort of attention has been had for Witcher, just on the western end of the spectrum, but for core players this is hardly a hurdle. The game, in and of itself, has been getting proliferated aggressively over the internet by CDPR. meanwhile The Witcher 3 had zero or almost zero advertising and as reported by hiska-kun, it was sold-out, so with a bigger shipment it could have performed better than it already did. what were the revenue totals for 2014? I hope Gung-Ho gives another update on how much P&D is making per day next quarter, since it's been #3 or even #4 quite often lately, and it will help illuminate where a lot of titles are peaking. Am I missing something? Does that Japanese number include as much stuff? Software (including PC, but not mobile) was about $3.5 billion. It doesn't say, but I don't think peripherals, used games, or PC are included. PC wouldn't add too much, but used would be huge, if not included. Are used games included in this numbers? Because is a big market in Japan. Gaf user Captain Smoker used to make these cool international game markets spreadsheets with hardware/software/mobile etc breakdown and everything but he's not as active these days. Sadly it seems like the links are all dead too. Well I was originally talking about whole deticated gaming markets in both countries =P. Maybe it got bit mixed along these multiple posts lol. thank god the ps4, vita, xbox one, and wii u are around to save this market from the ailing 3ds. 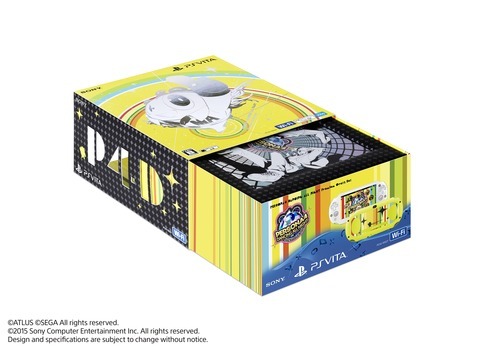 They even have a LE vita this time, I don't think they can delay it any further. As long as it comes out before the end of 2015, I'm not sure it'd matter. It's not like Vita has any other big titles planned for the second half of the year outside of possibly Tokyo Xanadu. (And SaGa 2015 which we haven't even seen a screenshot of yet). As long as it comes out before the end of 2014, I'm not sure it'd matter. At least this week was better than last week. And next is Splattoon. Last week might have been the yearly low, unless Sep. or Oct is weak this year as well. So in the US market in the NPD threads, folks have been generally saying the market contraction has already happened for dedicated consoles & handhelds. Do folks here think that's the case with Japan? Or that the dedicated market will continue to contract even further? That's a great debut for The Witcher. Do Japanese gamers even take Famitsu's scores seriously anymore? I know I don't. But yep, great numbers considering everything. I'm surprised.